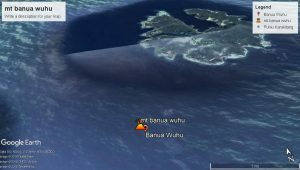 Banua Wuhu submarine volcano rises more than 400 m from the sea floor in the Sangihe Islands of Indonesia. Historical records show that several ephemeral islands are formed and disappeared. A 90 m high island was formed in 1835, but then dwindled to only a few rocks in 1848. Another new island was formed in 1919 but then disappeared by 1935 . Mount Banua Wuhu is in the southwest of Mahengetang Island which has an area of approximately 1 km2, the population living on the island is not necessarily, but only the fishermen and the manager of the coconut plantation. The inhabitants only have a somewhat flat area, even the old crater that is contested as a residential area. 1835: 23 – April 26, The earliest recorded eruption in history took place, namely the lava flow from the central crater. 1904: 17 – April 18, August 27. The explosion of the central crater threw rocks all the way to P. Ngihadi beach. 1919: 2 February: lava exit 2 April: lava exits and explosive eruptions, tidal water, great explosions occurred that destroyed coconut trees and burned 25 houses on the east coast. April 3: 10:30 am eruption with a blob of steam boiling as high as 4 – 5000 m accompanied by great eruptions. Indonesian Forest Copyright © 2019.